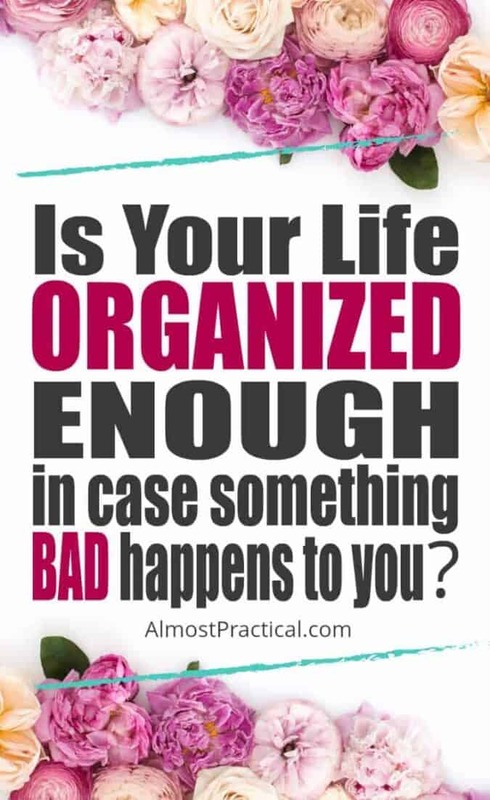 Is Your Life Organized Enough - In Case Something Bad Happens To You? Is Your Life Organized Enough – In Case Something Happens To You? Take a look around you. Is your life organized? Is it organized enough, in case something happens to you? Here are some things to think about in the event that your loved ones have to pick up where you left off. If something were to happen to you tomorrow, what would you be leaving behind? Last week, someone I know died suddenly. I saw him one day, and the next day he was gone. And it made it painfully obvious that tomorrow is not a certainty. Now take another look around you – would you want to leave everything you see to the people that you love the most? Despite having been a professional organizer, there are areas of my life that could use more organization. Right now if someone had to pick up where I left off, they would need to spend a lot of time and effort figuring out how to tie up loose ends and deal with stuff. All of this on top of their already busy lives. If you don't already have roadmaps in place for those you love, it's time to get start getting your affairs in order. Here are some tips for organizing your important documents and passwords – so the people you love won't be left with the gift of cleaning up your mess. should be organized and kept safely. In this article Amy Volk recommends using a fire safe file box to store this type of documentation. Some people also keep such items in a safe deposit box at a bank. This is a good start. Let your significant others know that they can find everything important in that one spot. Unfortunately, this is only one piece of the pie. We manage many of our important accounts digitally. Most banks want us to opt out of paper statements altogether. This can make for a really interesting scavenger hunt, but more likely than not will create stress for the person that is trying to figure it all out. If you leave an A to Z roadmap, the process of closing out your accounts will much easier for others. Make a list of your accounts, and explain how you access them. Make a list of recurring charges – so someone can quickly call those services and stop future charges. And what about those pesky passwords? Passwords pose another problem – security. Apps like 1Password (see my review here) allow you to create multiple vaults and share them. A nice thing to do would be to separate your important passwords from everything else – so those you care about don't have to sift through a ton of information to find what they are looking for. Aside from the practical reasons for leaving a digital trail, there are emotional considerations too. Facebook now allows you to designate a legacy contact. By doing this you give another person the authority to handle your Facebook account after your passing. It may seem trivial, but having your Facebook profile up and running after you are gone may be upsetting to your friends and relatives. Alternatively, they may take comfort in the outpouring of messages and want to leave the profile up. Along the same lines as passwords is “contacts” or your address book. The majority of us keep our contacts on our phone or computer. Both of these devices are often locked with a password. Your significant other will want to have access to that for obvious reasons. One of the biggest gifts you can leave for your loved ones is a comprehensive set of instructions on what they should do and who they should contact if the unthinkable happens. The time to plan for that is now. Is Your Life Organized Enough? Can people pick up where you leave off? Tell us the steps you've taken in organizing your important documents in case the unthinkable happens. Great article Neena, something we all have to think about. I see the struggle people have with this subject all the time. We think we have all the time In the world, but as you know from personal experience that can change in an instant. Very sorry for the loss of your friend. Thank you for the kind words. It is never easy to lose someone – and to lose someone suddenly is doubly difficult. No one wants to think about it – and we all have so many unfinished projects. I guess it’s just about being mindful of how you go about the record keeping – always keeping in mind the perspective of someone looking in from the outside. Thanks for that informative article. My condolences on the loss of your friend. My name is Megan, and I work for AgileBits, the makers of 1Password. We’re honoured that you included us in this post – it’s such an important topic to be discussing and thinking about. One of our users has created a document that can be very helpful in preparing for this kind of thing: the 1Password Emergency Will Kit (http://productivityist.com/1password-emergency-kit-3). If you have any questions about 1Password, we’d be happy to continue the conversation. I am so honored that you stopped by – and thank you for your condolences. I have been a long time user of 1Password and recommend it to everyone that I know. So many people freeze when they need to log into a website that they have not visited for a long time. It is common for people to just hope that their browser has kept them signed into the sites they commonly visit. And it really makes me cringe. Security reasons aside, as a productivity coach, I am painfully aware of the amount of time that people waste guessing at forgotten passwords. There really is a better way, thanks to you! I will continue my crusade to make everyone a 1Password convert. Once again, thanks for the comment. And I would love to continue the conversation. This is such an important topic and I think so many of us really neglect this area of our life. I love the resources you shared for digital accounts. When my father passed away (in another country) it was very difficult trying to figure out his account information. This is also something that I keep telling myself I want to get together and I have not made it a priority yet but I can totally see how important it is. Thanks for giving us all a swift kick in the pants to remind us. We all need that once in a while, right? Best wishes for your upcoming weekend Neena. Take care. Your comment is a reminder to me that my stuff is not in as good of an order as it could be. Life always seems to get in the way – doesn’t it? The last thing that I want to do is saddle my children with a ton of paperwork. The best way to tackle such a big project is setting aside time on a regular basis to work on it. And that is what I plan to do. Thanks so much for thanking me for reminding you which in turn reminded me -;-).